On March 30, 2017 at approximately 1651hrs, the Turner Valley RCMP and Okotoks RCMP responded to a complaint of an armed robbery at Sandul's Pharmacy, situated at 127 Centre Ave SW in Black Diamond, AB. The male suspect was captured on the surveillance system entering the back door and immediately proceeding to the dispensary where the medication is kept. The male climbed over the waist high gate and pulled out a knife on the staff. He ultimately gained access to the safe and removed a quantity of various narcotic drugs prior to fleeing on foot through the back door and down the alley, last seen south bound on 1 Street. 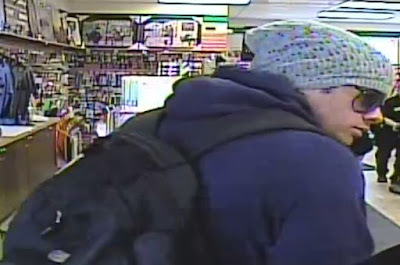 The suspect male was described as Caucasian, approximately 20-30 years old, 6 feet tall, wearing a dark blue hoodie, grey sweat pants, black gloves, black backpack, white and black running shoes, dark sunglasses and a light bluish/grey knitted toque which he pulled down to cover his face. Police are seeking public assistance in identifying the male responsible for this crime. Anyone with information is asked to contact the Turner Valley RCMP Detachment at (403)933-7227 or Crime Stoppers by phone at 1-800-222-8477 (TIPS), by internet at www.tipsubmit.com, or by SMS. Goodfish Lake, Alberta – Following continued investigation into an aggravated assault that occurred on March 11, 2017, the St. Paul RCMP have arrested John Delver and Adrian Cardinal in relation to this incident for their outstanding warrants. Both turned themselves into police and were released from custody with court conditions. There next court appearance will be April 27, 2017 in St. Paul Provincial Court. James Tory Jackson a 40-year-old from Goodfish Lake remains wanted for Aggravated Assault and Possession of weapon for dangerous purpose. If you have information regarding the whereabouts of James Tory Jackson, please call the St. Paul RCMP at 780-645-8888 or call your local police. Jackson should not be approached. If you want to remain anonymous you can contact Crime Stoppers by phone at 1-800-222-8477 (TIPS), by Internet atwww.tipsubmit.com or by SMS (check your local Crime Stoppers www.crimestoppers.ab.ca for instructions). On April 5, 2017 at approximately 12:15pm the Cochrane RCMP responded to a robbery with a weapon, at a Pharmacy in Bragg Creek, AB. The alleged suspect fled the pharmacy on foot, in an unknown direction, with an undisclosed amount of money, and other items that are still to be determined.. There were no injuries to the clerk at the pharmacy. 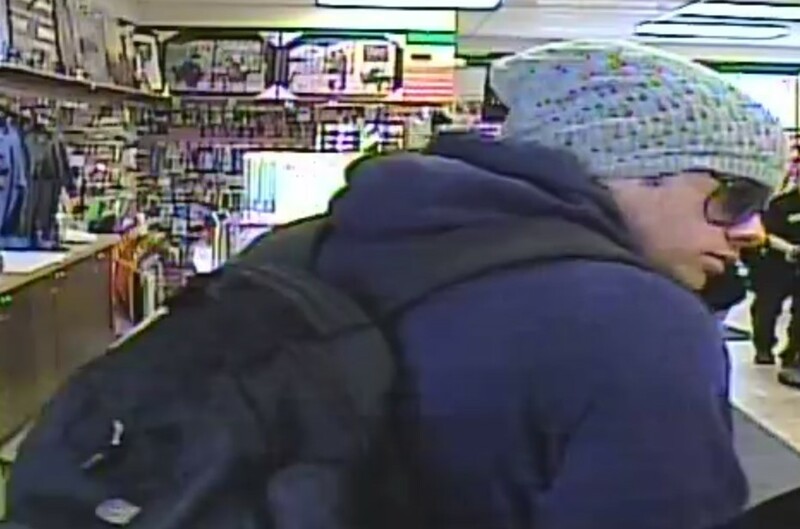 The suspect is described as a caucasian male, 20-35 years of age, slender, approximately 5'6" tall, wearing a dark hoody, and a light coloured toque, carrying a black backpack. The RCMP are asking that if you see this male, to call 911 immediately. This robbery is still actively under investigation. Further information will be released as it becomes available. The RCMP are asking that if you have any information regarding this incident, to please contact the Cochrane RCMP at 403-851-8000 or Crimestoppers at 1-800-222-8477. Beaverlodge RCMP – On Monday April 3, 2017 at approximately 11:50 am, police responded to a shoplifting complaint at a hardware store in Beaverlodge, Alberta. A male and female suspect were seen stealing items from the store. They left in a vehicle prior to police arriving on scene but the clerk was able to provide police with the licence plate number of the vehicle. A short time later police located the vehicle parked in front of a convenience store in Beaverlodge. Police located the male and the female inside the store where they were arrested without incident. Further police investigation led to the search of the vehicle where a small amount of methamphetamine was seized, property belonging to local merchants as well as property stemming from an occurrence which happened in Hinton, Alberta on March 17, 2017. BENSEN and LACEY are scheduled to appear in Grande Prairie Provincial Court on April 12, 2017. The recovered property will be returned to their rightful owners. Beaverlodge RCMP would like to thank the public for their assistance in this matter. If you have information on this or any other crime, contact Grande Prairie RCMP Detachment at 780-830-5700 or your local police department. Should you wish to remain anonymous, you can contact Crime Stoppers by phone at 1.800.222.8477 (TIPS) or by Internet at www.tipsubmit.com. On April 3 at approximately 1:50 am Beaumont RCMP attempted to conduct a traffic stop on a blue Hyundai Tucson but the driver of the Hyundai fled from police. Later in the morning at approx. 9:00 am the same vehicle was found abandoned in a swampy area on the east side of the town of Beaumont, AB. Police database checks confirmed the vehicle was stolen out of Edmonton, AB. A suspect associated with the stolen vehicle was identified and he had fled from police. 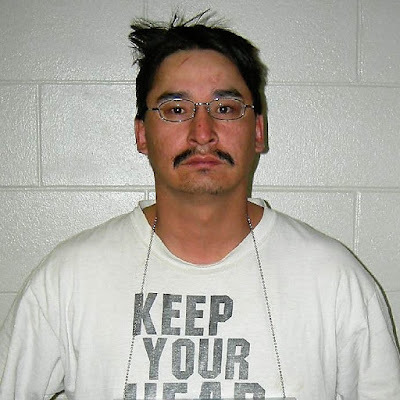 After a brief foot pursuit, Michael David SHIMARO-CAMPBELL 28 years of age of Edmonton was taken into custody. Mr SHIMARO-CAMPBELL has been charged with nine Criminal Code offences. Mr. SHIMARO-CAMPBELL is scheduled to appear in Leduc Provincial Court on April 6th 2017. Beaumont RCMP wants to thank the citizens of Beaumont who assisted in reporting the suspicious activities and location of Mr. SHIMARO-CAMPBELL, leading to his successful apprehension. ALERT - Inspector Chad Coles of the RCMP has been appointed Chief Executive Officer of ALERT. Coles will be the officer in charge of the provincially funded, integrated unit that addresses organized and serious crime across Alberta. ALERT was established and is funded by the Alberta Government and is a compilation of the province’s most sophisticated law enforcement resources, including officers with Calgary Police Service, Edmonton Police Service, Lethbridge Police Service, Medicine Hat Police Service, and RCMP. ALERT’s integrated teams investigate everything from drug trafficking to child exploitation to gang violence. “I’d like to congratulate Insp. Chad Coles on his appointment of Chief Executive Officer of ALERT. His career leading organized crime teams throughout the province, as well as more than two decades with the RCMP, will enable him to lead this vital team of specialized units. The valuable work ALERT does is an integral part of ensuring the safety of all Albertans,” said Kathleen Ganley, Minister of Justice and Solicitor General. 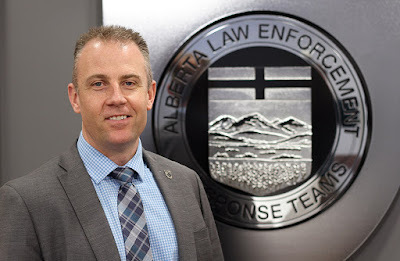 Coles has been with ALERT since 2015 and oversaw the regional organized crime teams based in Fort McMurray, Grande Prairie, Lethbridge, Medicine Hat, and Red Deer. His appointment was made official at the ALERT Board of Directors meeting in March. “On behalf of the ALERT Board of Directors, I wish to congratulate Insp. Coles. I know he will continue to grow ALERT, expand on the strong relationships with our policing partners, and build upon the legacy left behind by Supt. Charmaine Bulger,” said Board chair Don Johnson. Coles is a 21-year member of the RCMP with a third of his career spent as a member of integrated units. Prior to ALERT, Coles was a member of Saskatchewan’s Combined Forces Special Enforcement unit and spent time in Saskatoon, Regina, Prince Albert, Nipawin, and Cumberland House. Coles grew up in Moose Jaw. Coles replaces Superintendent Charmaine Bulger, who recently retired after 35 year career with the RCMP. Since being formed in 2006, ALERT teams from across the province have made nearly 10,000 arrests, seized $595 million worth of harmful drugs, and have taken 1,200 firearms out of the hands of criminals. RCMP in Strathmore have charged a 39-year old female with drug offences, after responding to a call involving property damage from a firearm. On Sunday, April 3, 2017 at 8:15 p.m., Strathmore RCMP received a complaint of property damage at a local motel, where it appeared a firearm had been discharged. During the course of the investigation, officers arrested a woman for drug possession and seized 48 grams of cocaine, along with some crystal meth. The woman was also in breach of conditions that had resulted from drug charges laid just a few weeks prior. 39-year-old Echo Brandt of Strathmore is facing numerous charges which include: Possession of a Controlled Substance for the Purpose of Trafficking; Possession of a Controlled Substance; and Fail to Comply with an Undertaking. Police are still investigating the nature and circumstances surrounding the initial complaint of property damage, and no charges have been laid in relation to that. If you have any information about this crime, please call Strathmore RCMP at 403-934-3968. If you want to remain anonymous you can contact Crime Stoppers by phone at 1-800-222-8477 (TIPS), or by internet at www.tipsubmit.com or by SMS (check your local Crime Stoppers www.crimestoppers.ab.ca for instructions). Blackfalds, Alberta – On April 4, 2017 at approximately 11:00 am, Blackfalds RCMP spotted a stolen Ford F350 truck parked on RR273. As Police approached the truck, the driver ran on foot into a field. A brief search of the area resulted in the 30 year old driver being arrested without incident. The truck was reported stolen from Ponoka. A short time after the arrest and recovery of the stolen Ford truck Blackfalds RCMP were dispatched to a suspicious person complaint at Princess Auto in gasoline alley. Police attended the area looking for three individuals and a white Nissan Pathfinder. While police were conducting patrols in the area, a white Nissan SUV was spotted travelling west on Mackenzie Road. The SUV continued west through the intersection and collided with a white Dodge minivan on Highway 2A which had been travelling northbound. When police arrive on scene the 27 year old female driver of the Pathfinder was attempting to force her way into another motorist’s vehicle. The driver was arrested at the scene and the Pathfinder was determined to have been stolen from Blackfalds earlier in the morning. Both parties involved in the collision were transported to Red Deer hospital with minor injuries. Police do not believe the stolen vehicle occurrences are related. Investigators are asking anyone who may have information regarding this occurrence to contact Blackfalds RCMP at (403) 885-3300. If you want to remain anonymous, you can contact Crime Stoppers by phone at 1-800-222-8477 (TIPS), or by internet atwww.tipsubmit.com. You do not have to reveal your identity to Crime Stoppers, and if you provide information to Crime Stopper that leads to an arrest(s), you may eligible for a cash reward. Red Deer, Alberta – Red Deer RCMP have made a number of arrests over the past week for offenses involving stolen property, drugs and weapons. One man was arrested after two men were stabbed in an altercation downtown, and another was arrested after robbing a victim of cash and jewellery at knifepoint. Many of those arrested were wanted on outstanding warrants or were breaching court-imposed conditions. Shortly before 4:30 pm on April 5, RCMP responded to a report of suspicious activity downtown. On arrival, RCMP located a suspect who was wanted on nine outstanding warrants out of Red Deer, Lacombe, Blackfalds and Edmonton for offenses including drug possession, possession of stolen property, theft, failing to comply with conditions, and failing to appear in court; during his arrest, the suspect was found to be in possession of a stolen license plate and marijuana. Coumantarakis made his first court appearance in Red Deer on April 6. Shortly after 5 pm on April 2, Red Deer RCMP responded to a complaint of an altercation at a business. On arrival, they located the female suspect in possession of controlled drugs and several weapons who was in breach of a number of probation conditions and recognizances. Williams was remanded and appeared in court in Red Deer on April 3, and again on April 6. Shortly after 4 am on April 4, Red Deer RCMP patrolling downtown located and arrested a man in possession of what is alleged to be methamphetamine and cocaine, as well as break-in instruments. Campbell made his first appearance in court in Red Deer on April 4, and appears again on April 6. Red Deer RCMP responded to a report of a personal robbery at 11:30 pm on April 1; the victim had been walking downtown when he was approached by two men, one holding a knife. The suspects stole cash, the victim’s watch, and a silver chain. RCMP located one suspect in the area and took him into custody without incident. Boysis appeared in court in Red Deer on April 3. He will appear in court in Red Deer again on April 10. Shortly after 3 am on March 31, RCMP responded to a report that two males had been stabbed during an altercation in downtown Red Deer. RCMP located the suspect nearby shortly afterward and took him into custody without further incident. The two male victims were treated by EMS and taken to hospital for treatment of non-life-threatening injuries. Bjarnason made his first appearance in court in Red Deer on April 3. He will appear in court again on April 10 at 9:30 am. Shortly after 10:30 pm on March 29, RCMP initiated a traffic stop on a suspicious vehicle as it drove on Spruce Drive. RCMP determined that the male driver was in possession of what is believed to be cocaine and methamphetamine and was in breach of court-imposed recognizances. Zeluf made his first appearance in court in Red Deer on April 6. ALERT - Three Edmonton women are facing charges under Alberta’s Drug-Endangered Children Act after allegedly exposing an infant to drug deals and cocaine production. ALERT Edmonton’s organized crime and gang team charged the three women on April 5, 2017. The women’s ages are 27, 26, and 26, but their names are not being released in order to protect the identity of the 11-month-old victim. The infant is the biological daughter of one of the accused. Police allege that the women brought the infant along on a number of drug transactions. ALERT expedited the investigation after growing concerns for the health and well-being of the child. A search warrant was executed at home in northeast Edmonton on March 23, where investigators found evidence consistent with cocaine trafficking. Cocaine processing equipment and residue was found throughout the home and the infant’s nursery doubled as a cocaine conversion lab, where the drug was being converted to crack cocaine. Edmonton Police Service’s Child at Risk Response Team (CARRT) provided assistance and the child was removed from the home. The Drug-Endangered Children Act makes it clear that children exposed to an adult's involvement in serious drug activity, such as trafficking, are victims of abuse and need protection. St. Albert, Alberta – Following an incident where HAZMAT and CLEAR teams were called in as precautionary measures, the RCMP can confirm that the residence of concern on Waverly Drive has been cleared. Neighbouring residents are back in their homes. At 10:06 this morning St. Albert RCMP responded to a complaint of suspicious activity. As a result of information on scene, a residence was contained and assistance was requested from support units. The St. Albert RCMP are continuing to investigate in relation to an incident at the involved residence. No further information will be provided in relation to the investigation as it is ongoing. Jasper, Alberta - In less than 24 hours, Jasper RCMP officers located and arrested two impaired drivers. During the early hours of April 6th, 2017 Jasper RCMP stopped a vehicle on Connaught Drive and conducted a sobriety check with the driver. The male driver was placed on a roadside screening device and failed the test. He was subsequently arrested for impaired operation of a motor vehicle and was transported to the Jasper RCMP Detachment where he provided samples of his breath. The 22 year old resident of Jasper was charged under the Criminal Code of Canada for impaired operation of a motor vehicle. His driver's licence was suspended and his vehicle was impounded. On April 7th, 2017 at approximately midnight, Jasper RCMP received a complaint for a possible impaired driver. A concerned citizen advised police that an intoxicated female had stumbled out of the Downstream and had driven away. RCMP officers were able to locate the vehicle driving on Pine Avenue. The female driver was placed on a roadside screening device and failed the test. She was subsequently arrested for impaired operation of a motor vehicle and was transported to the Jasper RCMP Detachment where she provided samples of her breath. The 21 year old female, also a resident of Jasper, was charged under the Criminal Code of Canada for impaired operation of a motor vehicle. Her driver's licence was suspended and her vehicle was impounded. During their interactions with police, both subjects attempted to hide their consumption of alcohol from the officers. Impaired driving continues to be the leading cause of accidents in Canada with over a thousand people being killed every year in impairment-related crashes. Jasper RCMP officers continue to be out in full force every day and every night in an attempt to locate and remove impaired drivers from our roads and ensure safe driving behaviours of all motorists. The Jasper RCMP also encourages you to call 911 if you suspect a driver is impaired. Red Deer, Alberta – Red Deer RCMP seized 14 firearms, explosives, thousands of rounds of ammunition and numerous credit and debit cards during a search warrant at a residence in the Normandeau neighbourhood on April 6. At 7 am on March 6, Red Deer RCMP responded to a report of a break and enter at a commercial yard in north Red Deer. Police located the suspect and initiated a traffic stop, taking him into custody without incident. As the investigation continued, shared intelligence between Sylvan Lake RCMP and Red Deer RCMP regarding recent property crimes, including firearms thefts in the area, led Red Deer RCMP to apply for a search warrant for the suspect’s residence. Red Deer RCMP executed the search warrant at a residence in the Parkside Estates mobile home park at approximately 9 pm on April 6. A number of the 14 firearms that police seized had been illegally modified; RCMP also seized six replica firearms, numerous stolen credit and debit cards, tools, thousands of rounds of ammunition and various other items. When police located the fireworks and explosive materials, the RCMP Explosive Device Unit was consulted to ensure the safe handling and disposition of those items. RCMP continue to investigate. An update will be issued as more information becomes available and when charges have been sworn before the courts. If you have information about this investigation, contact the Red Deer RCMP at 403-343-5575. If you wish to remain anonymous, call Crime Stoppers at 1-800-222-8477 or report it online atwww.tipsubmit.com. If your information leads to an arrest, you could be eligible for a cash reward up to $2,000. Wood Buffalo RCMP - On April 7th, 2017, at approximately 9:00 AM, Wood Buffalo RCMP entered into an investigation at Composite High School, regarding threats against a student. Officers are on scene at Composite High School, and the school district is ensuring that the school is appropriately secured. Police have arrested one 16 year old male, who can not be identified as he is a youth. This investigation is ongoing, and further information will be released when possible. Police are requesting that anyone with any information regarding this occurrence contact the Wood Buffalo RCMP at (780) 788-4000. Alternatively, if you would like to remain anonymous, you can contact Crime Stoppers by phone at 1-800-222-8477 (TIPS) or at www.tipsubmit.com. You are not required to reveal your identity to Crime Stoppers, and if you provide information to Crime Stoppers that leads to an arrest(s), you may be eligible for a cash reward. Grande Prairie, Alberta – As the result of an ongoing investigation, on March 30, 2017 Grande Prairie Crime Reduction Unit, with the assistance of Grande Prairie General Investigation Section executed a Search Warrant at a residence in Grande Prairie. One male was arrested at the residence. The following items were located and seized during the search: 132 grams of Cocaine, evidence consistent with cocaine trafficking, a small amount of Cannabis Marihuana, and $2,420 in Canadian currency. 22-year-old Aaron Bertrand of Grande Prairie is facing the following charges: Possession of Cocaine for the purpose of trafficking, possession of proceeds of crime less than $5000, possession of a controlled substance and 5 counts of failure to comply with recognizance. Bertrand was remanded in custody and is set to appear in Grande Prairie Provincial Court on April 10, 2017. Red Deer, Alberta – Red Deer RCMP are investigating the circumstances of a collision yesterday afternoon after a motorcycle refused to stop for a peace officer and collided with a mini-van. Shortly before 6 pm on April 6, a Community Peace Officer was conducting traffic enforcement on 40 Avenue, north of 55A Street when he clocked a motorcycle driving southbound on 40 Avenue at just over 90 km/ hour in a 60 zone. The peace officer, who was on foot and in uniform, stepped forward and indicated that the motorcycle should pull over; at that point, the motorcycle accelerated away from the peace officer and collided with the rear end of a mini-van that was travelling southbound on 40 Avenue. The motorcycle continued to slide and subsequently struck a truck that was also travelling southbound. The driver of the motorcycle was taken to hospital to be treated for numerous injuries that are not life-threatening. The drivers of the mini-van and truck were not injured in the collisions. Police continue to investigate the circumstances of this incident and will issue an update as more information becomes available. Red Deer, Alberta – Red Deer RCMP and the RCMP Emergency Response Team (ERT) seized hundreds of rounds of ammunition, numerous bladed weapons, a shotgun and a replica firearm during a search warrant at a Riverside Meadows residence on April 5. Red Deer RCMP and ERT executed the search warrant at a residence in the area of 53 Avenue and 58 Street at approximately 9 am on April 5. As well as the shotgun and replica firearm, RCMP seized more than 200 rounds of ammunition for use with various firearms, a number of knives and various other assorted weapons including batons and a machete. RCMP located a 23 year old women and a 24 year old woman at the residence who were both wanted on outstanding warrants; one was wanted on two warrants and the other was wanted on seven warrants. They were taken into custody without incident. RCMP continue to investigate and are asking anyone with information about this investigation to contact the Red Deer RCMP at 403-343-5575. If you wish to remain anonymous, call Crime Stoppers at 1-800-222-8477 or report it online at www.tipsubmit.com. If your information leads to an arrest, you could be eligible for a cash reward up to $2,000. Westlock, Alberta – Yesterday morning at approximately 7:00 a.m., Westlock RCMP responded to a report of a head on collision between a truck and semi-truck north of the Hamlet of Flatbush on Highway 44. The truck was heading northbound when it crossed the centre line and collided with a southbound semi-truck. The 24-year-old lone male occupant of the truck from Edmonton was pronounced deceased at the scene. The driver of the semi-truck was not injured. Traffic was re-routed around the scene for several hours while police investigated. Road and weather conditions are not believed to be factors in this collision. The name of the deceased will not be released. Charges will not be laid regarding this collision and no further updates will be provided. Airdrie, Alberta - On April 4, 2017, at 10:30pm, Airdrie RCMP received a complaint of theft from Walmart. An unknown male and female exited Walmart with two carts of unpaid merchandise. The merchandise was then loaded into a stolen vehicle prior to Walmart staff approaching the pair. The male and female were able to depart Walmart with some of the stolen merchandise. On April 5, 2017, at approximately 4:30am, Airdrie RCMP received a complaint of a theft of truck from the Kingsview Market area. Airdrie RCMP members attended immediately and were able to arrest the male whom was trying to flee the scene on foot. The female was able to flee the scene in a vehicle but, was arrested a short while later falling asleep in the parked vehicle. The stolen vehicle was the same vehicle used in the Walmart theft. 31-year old Anthony James Potts is charged with numerous offences including: Theft Under $5000, Possession of Stolen Property, Resist Arrest, Fail to Comply with Undertaking, in addition to numerous outstanding arrest warrants. 44-year old Diane Renee Fiddler is charged with numerous offences including: Flight from Police, Fail to Comply with Recognizance, Theft of Credit Card, Possession of Stolen Property, Driving an Uninsured Motor Vehicle, in addition to numerous outstanding arrest warrants. Airdrie RCMP would like to thank Airdrie citizens, loss prevention officers, and Walmart staff for their assistance on this matter.